Dock Lifts and Truck Levelers are designed to make your dock area 100% accessible regardless of truck height or load type. These specialized lifts keep material level throughout the loading and unloading operation while providing a stable and solid working area for off-loading trucks and trailers. Hydraulic Dock Lifts make your loading dock completely accessible and efficient, regardless of the load type or truck height. They are a cost efficient alternative to space-wasting truck well recesses and concrete ramps. 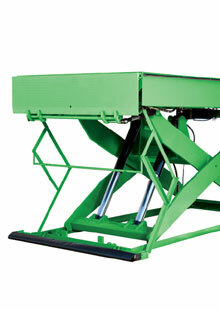 Truck Levelers are used when a dock is too high or low to properly service vehicles with standard dock levelers. Our truck levelers safely raise or lower the truck to match the load height with the loading dock.